The concert will be an unprecedented collaboration between the Instrumental ensembles and the Art Department in the auditorium. Art I and Art II students are creating fine art corresponding to musical selections. It's sure to be a creative evening highlighting St. Pete High's wonderful musicians, artists, and our departing seniors! 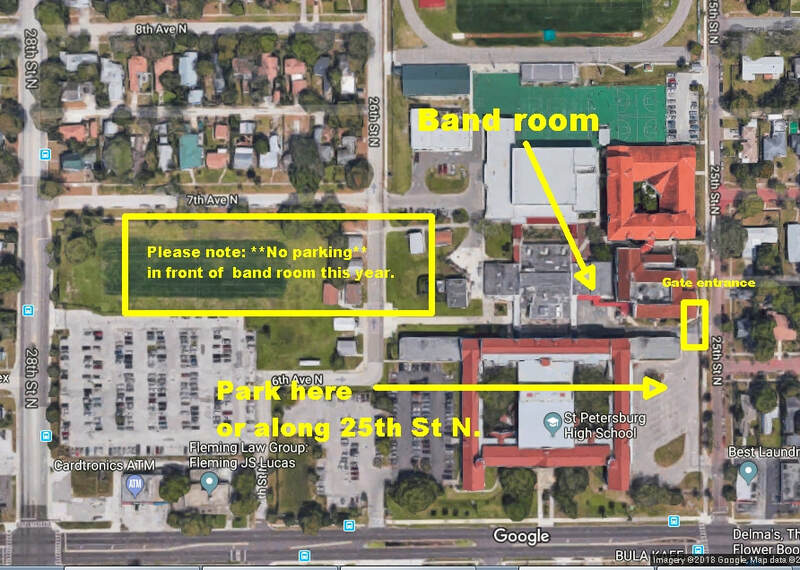 The Annual Band Banquet will be Friday May 3 from 6 pm to 10 pm at the St. Pete Country Club. RSVP by April 23. Tickets are $25, seniors are free. Band Apparel Catalog is Finally Here! Update 11/16/2018 on the Crest t-shirt: Because we didn't meet the minimum number of orders on the shirt, our vendor couldn't produce the shirts for us. But good news: I shopped around and found a vendor who could do our smaller order AND at a reduced price. The price has been reduced from $22 to $18. (The price is based on the number of colors and the number of guaranteed orders). I'll refund the difference to those who have already paid for their orders. In case anyone wants to order a shirt at the reduced price, let me know by November 30 by following the same order procedures below. This is only for the crest shirt. We'll have to create another catalog for the other items. A number of pesky gremlins hindered the creation of a catalog this Fall but I finally have something to offer. It is a limited set but does include a new shirt design based on an historic St. Pete High emblem that predates even the green devil. Because the crest shirt has multiple colors like the original crest, it is more expensive than a regular shirt. However, a variety of shirt colors are offered for that design. Order form below can be downloaded in PDF or Excel format. Put a copy of the form in the registration box in Ms. Aucremann office or you can email the file to sphsbandboosters@gmail.com. The catalog shows the back design for just one color but all of the crest shirts have the same design on the back. If you want to see an example of another color, send a message per contact below with the color(s) you want to see. If paying by check or cash, put it in the safe in Ms. Aucremann's office. Please be sure to write your name and amount on an envelope before putting payment into the safe. You can pay online using a Paypal button will be appear below. Please don't use any other Paypal buttons in this website! Send an email to sphsbandboosters@gmail.com or text (727) 537-0470. Order form below in in PDF or Excel format. 3. A Paypal window will open. Though that window says "Donate" you are actually purchasing shirts. 4. Enter your total purchase amount. 5. You have two payment options: To pay using your Paypal account or pay using a credit or debit card. 6. When it asks you to share your email address, DO share it in case I have to get back to you with any questions about your order. 7. You will be returned to this page when finised. Remember to turn in your order form by email or in Ms. A's office. The map below shows the location of the band room and the nearby gated entrance. Parking is allowed in the bus area or along the street. Please note that no parking is allowed in front of the band room this year. However, if are dropping off food or water donations, etc, you can unload in front of the band room but please move your car after unloading.